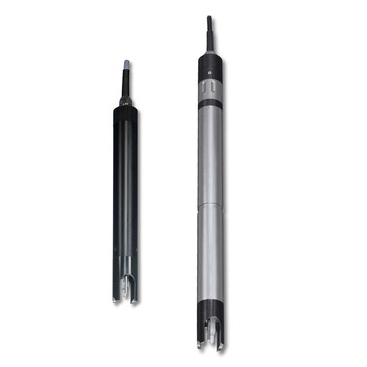 Designed specifically for harsh applications, the SensoLyt® sensors are precision engineered assemblies, which consist of a submersible housing with a built-in preamplifier and the appropriate combination pH or ORP electrode. In combination with our high-performance monitors, the sensors constitute an integrated, extremely reliable pH/ORP measuring system which represents the highest standard, state-of-the-art technology with regard to accuracy, EMC noise immunity and economy. The digital technology of the IQ sensors, which can store calibration values directly in the sensor, offer particular advantages. This feature allows the user to calibrate the sensor in the laboratory and then return it to its location of use. This provides a certain independency, especially in winter or with bad weather conditions. Its sensor's quick coupler permits direct reintegration into the system. The SensoLyt® 700 standard assembly incorporates an integrated preamplifier and a built-in stainless steel NTC temperature sensor. When using a WTW monitor, a special circuitry allows the pH electrode to be monitored for glass breakage. In addition, the SensoLyt® 700 offers as a standard feature an efficient lightning protection system. The SensoLyt® 700 sensor assembly can be fitted with any combination electrode of the SensoLyt® series. It is compatible with all WTW monitors of the EcoLine and QuadroLine® Series. Same as SensoLyt® 700, but without the SensCheck function. The SensoLyt® 650 unit is a passive assembly without preamplifier; i.e., it is designed for "high-impedance operation" with the electrode connected directly to the monitor input. The assembly is directly compatible with the high-impedance input of following WTW monitors: pH 170 and pH 296 or Stratos 2211 X pH models. Digital pH/ORP armature with integrated preamplifier and lightning protection as well as digital signal processing and integrated temperature probe for connection to an IQ SENSOR NET. A special circuiting permits glass breakage detection monitoring. Due to the integrated calibration value memory, a "pre-calibrated pH measurement", the value of which is stored in the sensor, can be set in the laboratory. The sensor's quick release coupling allows the user to remove it from the location of use and return it after successful calibration in the laboratory. With an IQ connection in the laboratory, inconvenient field calibration under adverse conditions can be completely eliminated.